At Falcon Windows we're pleased to welcome customers to our Ipswich windows, doors and conservatories showroom in our Brook House Business Park headquarters just off the Hadleigh Road in Ipswich, Suffolk. Front doors, stable doors, stylish long handle doors, sleek aluminium bi-folding doors; casement windows, arched windows and decorative window lights; guttering, fascias, thresholds and trim - you name it, you'll probably find it in our compact Ipswich windows, doors and conservatories showroom. You can see for yourself the quality products which the team at Falcon Windows pride themselves on installing. We've packed so many ideas and options into our Ipswich windows, doors and conservatories showroom, but of course what you see is only the tip of the iceberg! There are so many combinations and styles; wood, PVCu or aluminium alternatives; colours and fixtures and fittings which can quickly personalise your home improvement to match or transform your property. Chat through your ideas with one of our friendly team and they'll be only too happy to go through brochures or websites to outline all the options, always keeping your priorities and budgets in mind. Thinking about a garden room, loggia or orangerie to bring extra living space to your home? Wondering about alternative polycarbonate roof options for your current conservatory or interested in our Guardian Warmroof technologies which can make a conservatory into a year-round living space? Take a seat in our showroom conservatory and we'll explain the differences and talk you through key points to consider. All our honest, expert advice is free and comes with absolutely no obligation. So it's totally up to you whether you then choose to make an appointment for us to visit your property to look at the options in closer detail. Or you might be visiting the showroom after we have taken a look at your requirements on site, then we can talk over the details and browse options with specific samples. Either way, we respect the fact that the choice is always yours. Sliding sash windows; clever bi-folding doors with slimline aluminium frames and impressive security lock technologies; sleek sliding patio doors or decorative conservatory panels and all sorts of finials - in our Falcon Windows showroom, you can get a feel for just how our products work, from hinges and locks to low thresholds for smooth access, from widths of window boards to conservatory fans. 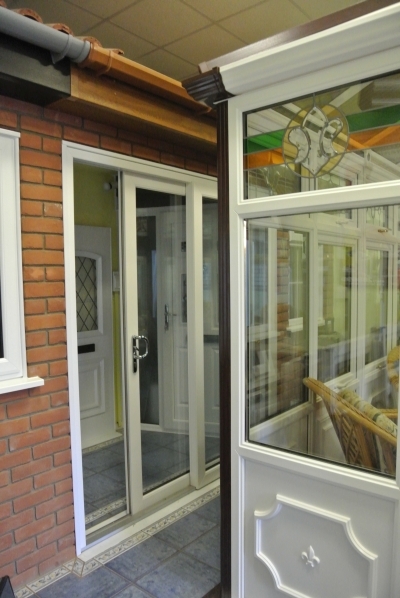 We'll help you see clearly the differences between all sorts of conservatory glass and polycarbonate options. And talk internal trim, jewelled glazing and chrome, gold or colour options on window and door furniture. We think you'll like more than just what you see, but get a real sense of the experience and knowledge which has led to our personal selection of great quality products. 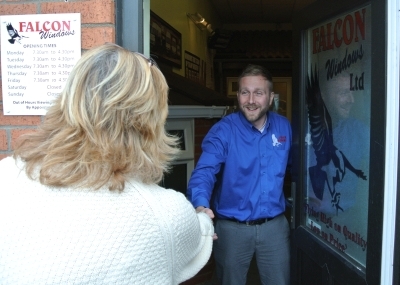 Our Falcon Ipswich windows, doors and conservatories showroom sits right alongside our offices and stores at our Falcon headquarters, where this family business is fittingly surrounded by the other companies in our Falcon Group. Our Ipswich home improvements showroom is open Mondays to Fridays from very early to 4.30 pm in the afternoon, but the Falcon Windows team are happy to welcome you in the showroom at other times by appointment. Do give us a call or pop along to see our showroom and meet the team. We look forward to welcoming you soon.